The Pop Up Park in downtown New Canaan on July 31, 2017. 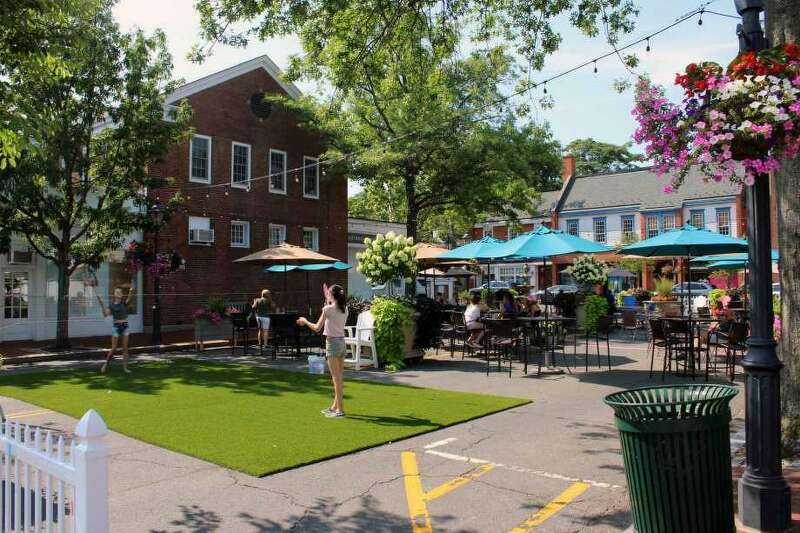 NEW CANAAN — You either do it with the Chamber of Commerce or not at all, was the selectmen’s message to the Pop Up Park Committee Tuesday. The relationship between the Pop Up Park volunteer committee, which erects a “park” on the intersection of South Avenue and Elm Street, and the Chamber of Commerce is fraught. Executive Director of the town’s Chamber of Commerce Tucker Murphy — a former liaison to the Pop Up Park Committee — said she had split from the group last week due to differences in thinking. Barbara Wilson, a member of the Pop Up Park volunteer committee, said the withdrawal of support from the Chamber came as a surprise, leading them to file for a special event application with the selectmen that seems unlikely to be approved unless the two parties work together. The dates the special event application listed for the park were from July 21 to Sept. 3. When Selectman Kit Devereaux asked if the Pop Up Park committee wanted to be fully autonomous, Wilson replied that wasn’t the case but they would prefer that the Chamber didn’t have the “final say” in certain decisions. Business owners affected by the park’s location also voiced their grievances. The park has been a five year tradition in New Canaan. Representatives from Elm Street Books, Togs and Odesmith & Richards criticized the location of the Pop Up Park, saying it disrupted their businesses. “The plans are cumbersome, people like the flow of traffic and a lot of our customers and other people go home and get on the internet... there’s a negative impact on the business,” Mary Jane Setter from Togs said. Murphy, who said she would be inclined to work with the Pop Up Park committee again, said she also had to take the business owners’ thoughts into perspective. “The elephant in the room is that we know the community loves (the Pop Up Park) but we don’t know if it helps or hurts businesses,” Tucker said. Selectman Nick Williams and First Selectman Kevin Moynihan said they would prefer if the Chamber and the volunteer committee work together. The selectmen tabled further discussion of the Pop Up Park for their July 10 meeting.